Leakage of employment income is a pressing issue in the economic development of regional and remote communities. It can draw income away from regional economies but also inject new revenue from outside. Using Australian Bureau of Statistics 2011 census employment data by place of usual residence and place of work, we identify for all 17 Local Government Areas (LGAs) of the Northern Territory (NT), workers commuting out of and into each LGA. Using summary graphs and geospatial visualizations we find that while there is substantial leakage out of most LGAs there are also gains from those leaving an LGA to work and then returning home with their income. Overall, for most LGAs and all remote LGAs there is net leakage. In contrast, Wagait, Palmerston, Litchfield and Alice Springs experience net gains from work commuting. Core-Periphery staples theory (Carson 2011) helps explain these net gaining LGAs, but cannot be used to consistently explain net leakage or net gain for population centers and nearby periphery LGAs. Darwin, including parts of Unincorporated NT, together act as a net leakage core to surrounding commuter LGAs such as Palmerston, Litchfield and Wagait. 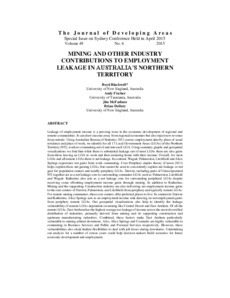 Katherine also acts as a net leakage core for surrounding peripheral LGAs despite receiving some offsetting employment income gains through mining. In addition to Katherine, Mining and the supporting Construction industry are also delivering net employment income gains to the core centers of Darwin, Palmerston, and Litchfield from periphery and typically remote LGAs. For remote mining commuters, these core centers offer preferred places to live. In contrast to Darwin and Katherine, Alice Springs acts as an employment income sink drawing on net employment gains from periphery remote LGAs. Our geospatial visualizations also help to identify the leakage vulnerability of remote LGAs dependent on mining like Central Desert and East Arnhem. Of all the remote LGAs, East Arnhem has the highest average net leakage of income across the most diversified distribution of industries, primarily derived from mining and its supporting construction and upstream manufacturing industries. Combined, these factors make East Arnhem particularly vulnerable to mining related downturns. Also, Alice Springs and Coomalie are highly vulnerable to commuting in Business Services and Public and Personal Services respectively. However, these vulnerabilities also cloak hidden flexibilities to deal with job losses during downturns. Undertaking our analysis for a number of census years could help decision makers build scenarios for future economic development and employment.